It’s a balmy Thursday morning in the New Lots neighborhood of East New York, Brooklyn, 70F (21C) and sunny on the last day of March. Small groups of middle-aged men banter outside bodegas and on stoops of the small, semi-detached brick houses that are common in the area. Mothers and grandmothers push strollers and watch over preschool children who hop and skip and revel in the unseasonable warmth. The sidewalks have awakened. Street life in East New York is busy, but not always congenial. The district is one of the poorest in the city, with about half the residents living below the poverty line. It’s also one of the most segregated. Nearly 95% of residents are black or Latino, and only 1% are white. The area is also among the most violent neighborhoods in New York City, with especially high levels of homicide, felony assault, and sexual assault. Social scientists sometimes call East New York socially isolated, because its peripheral location and limited public transit options restrict access to opportunities in other parts of the city, while people who don’t live there have little reason to visit and strong incentives to stay away. Conditions like these are bad for everyone, but research shows that they’re particularly treacherous for older, sick, and frail people, who are prone to hunkering down in their apartments. Living in a place like East New York requires developing coping strategies, and for many residents, the more vulnerable older and younger ones in particular, the key is to find safe havens. And on this and every other Thursday morning this spring, many residents who might otherwise stay home alone will gather at the neighborhood’s most heavily used public amenity: the New Lots branch library. There are more people living alone than at any point in history. That’s worrisome because, as a large body of scientific research now shows, social isolation and loneliness can be as dangerous as more publicized health hazards, including obesity and smoking. And while these problems may be particularly acute in older people in struggling neighborhoods like East New York, they’re hardly confined to them. Consider Denise, a fashion photographer in her late 30s whom I met in the Seward Park library children’s floor on a chilly April morning. She’s wearing jeans, a long black coat, and large tortoiseshell glasses. The children’s floor might not be a second home anymore, not since her daughter started preschool, but during her first few years of being a mother Denise was here almost every day. “I live close,” she tells me. “We moved here six years ago. I didn’t think about what it would mean to live by a library, not at all. But this place has become very dear to me. So many good things have happened because we come here.” Denise stopped working when her daughter was born, but her husband, an attorney, didn’t. On the contrary, the demands on his time increased, and he worked well into the evening, leaving her in a small Manhattan apartment with a baby she loved intensely but also with a feeling of loneliness beyond anything she’d experienced before. Marcus has vivid memories of the books she read in her branch library. It started with stories about ordinary kids in New York City living lives very different from hers, and in time she grew interested in books about female actors and film stars. “I remember finding a whole bunch of biographies of women who were queens and saints. Even now, I can physically see where this section was in the building. I was interested in queens because, well, why wouldn’t I be? They were like men who had done something. No other place in Marcus’s life worked that way: not home, where her parents monitored her choices; not synagogue, where she felt intense moral pressure but no sense of belonging; not school, where teachers and staff were quick to judge. The library, she learned, could accommodate nearly all of her interests, especially if she left her neighborhood and visited the main Queens library or the stunning central library on 42nd Street and Fifth Avenue in Manhattan. She remains a regular, to this day, though now that she’s the Orlando Harriman professor of English and comparative literature at Columbia University, finding time for public library visits isn’t as easy as it was when she was a kid. Cobb spent a lot of time alone in the library, exploring politics, art, and literature, and sometimes delving into controversial topics that he’d grown curious about during conversations at home or in church (he was raised Catholic). The library, he says, helped him become his own person, free to question authority and think for himself. Today, those are skills that he uses often. He’s a staff writer for the New Yorker and a professor of journalism at Columbia. Many public libraries do need renovations, particularly the neighborhood branches. But the problem libraries face isn’t that people no longer visit them or take out books. On the contrary: so many people are using them, for such a wide variety of purposes, that library systems and their employees are overwhelmed. According to a 2016 survey conducted by the Pew Research Center, about half of all Americans aged 16 and over used a public library in the past year, and two-thirds say that closing their local branch would have a “major impact on their community”. In many neighborhoods the risk of such closures is palpable, because both local library buildings and the systems that sustain them are underfunded and overrun. 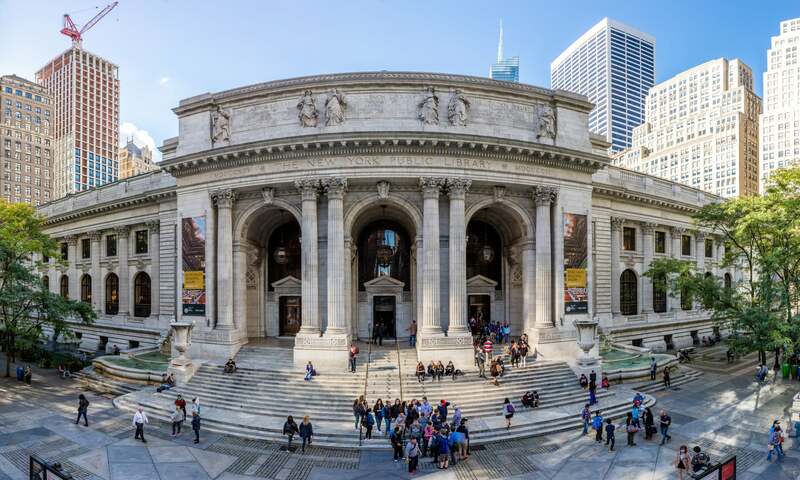 In New York City, library circulation is up, program attendance is up, program sessions are up, and the average number of hours that people spend in libraries is up too. But New York City doesn’t have an exceptionally busy library culture, nor is it a national leader. Urban library systems in the United States have long been public-private partnerships, and city governments have long relied on philanthropists to fund much of the library’s work. Still, it’s hard to understand why most cities give so little public support to their libraries. According to recent reports from the Pew Research Center, more than 90% of Americans see their library as “very” or “somewhat” important to their community, and in the past decade “every other major institution (government, churches, banks, corporations) has fallen in public esteem except libraries, the military, and first responders”. Our communities are full of children whose future, like Cobb’s and Marcus’s, will be formed in the places where they go to learn about themselves and the world they’ll inherit. They deserve palaces. Whether they get them is up to us.